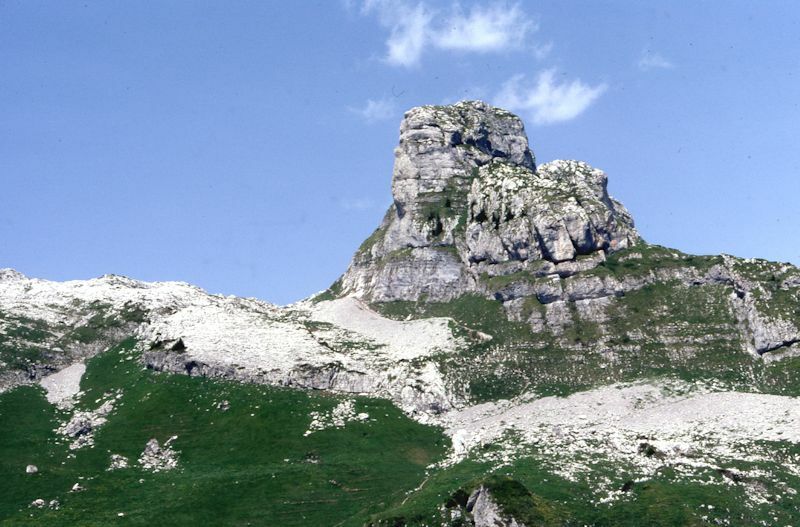 The long ship-like shape of Famelon (2137m) hangs beautifully between the end of the Truex ridge and the descent towards the pass into the Ayerne and Hongrin valley (Pierre de Moëllé) and Mont d'Or on the far side of that. 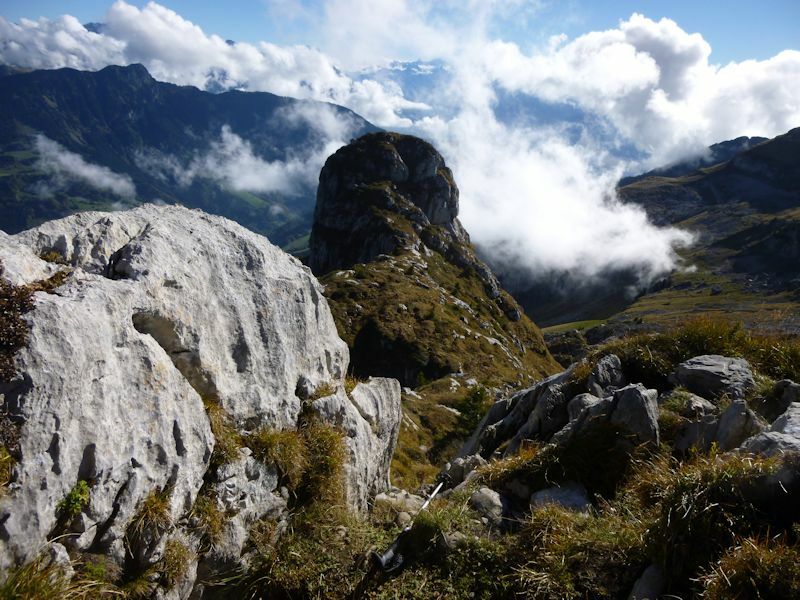 It has two summits, and the normal hiking trail leads up into the saddle (photo below), then up through the rocks to the higher one, with a little chain to help with the top bit. 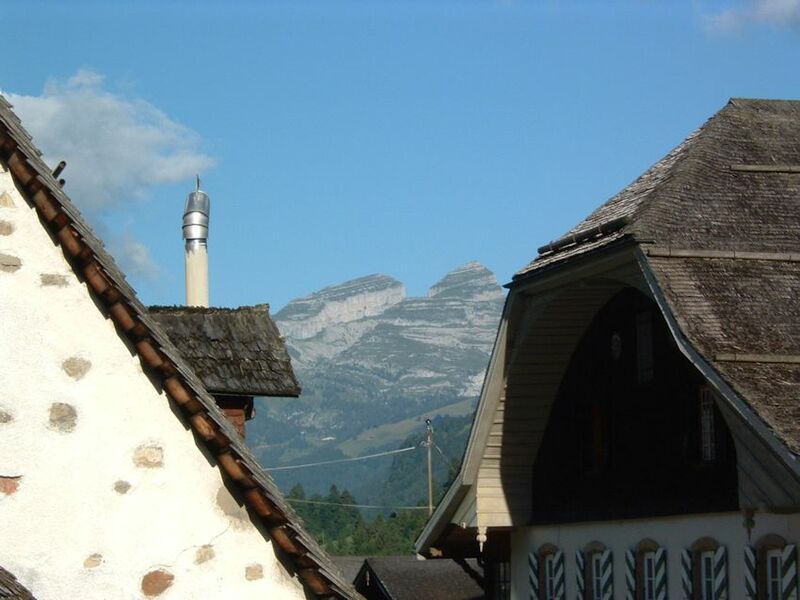 And here's Famelon from the prow end of the ship, from the Chalet des Fers, back before the skilifts were extended out that way in the early-mid '80s. 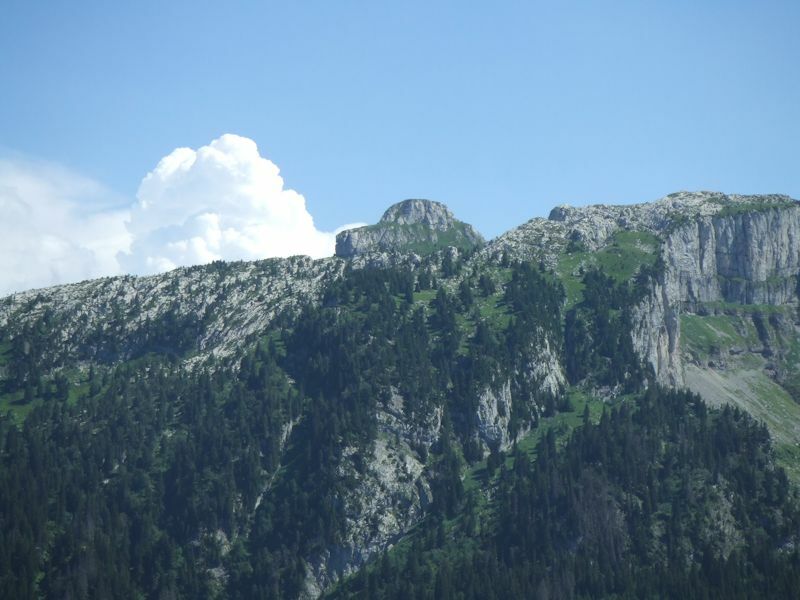 Avalanches from the Crête des Fers (left) were a common occurrence then and now. 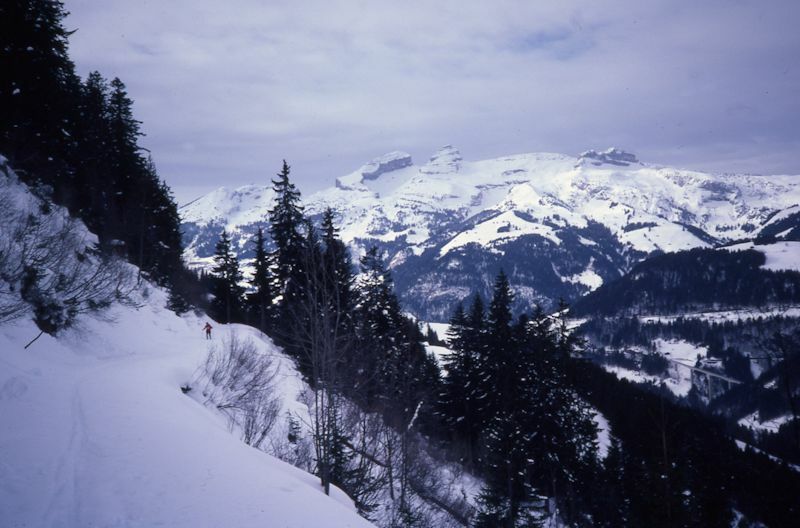 And the same, with the Chalet des Fers (before the skilifts), at dusk, with a nice avalanche scar running down from the left. 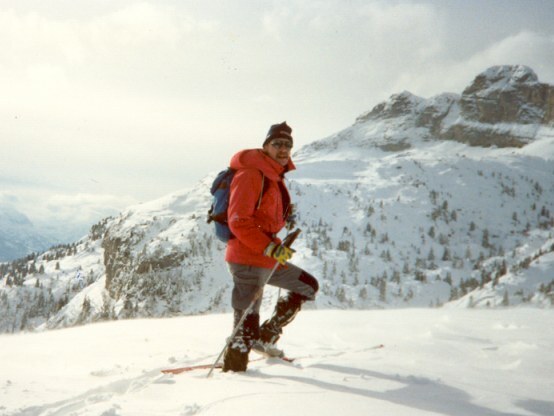 The present narrator has been caught in three avalanches in that same place (some people never learn), in one of which (in 1987) we almost lost ACS Prof. Ware, and in another of which (in 1992) we almost put away the narrator. Another summery shot of superb Famelon, to lighten the mood. 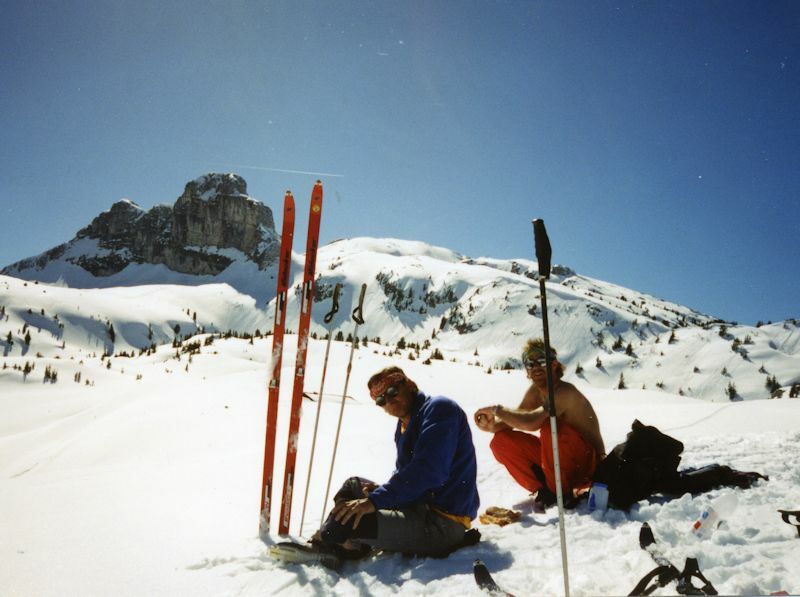 The Tour de Famelon from back behind in snowcaving country, 1991 or nearly so. 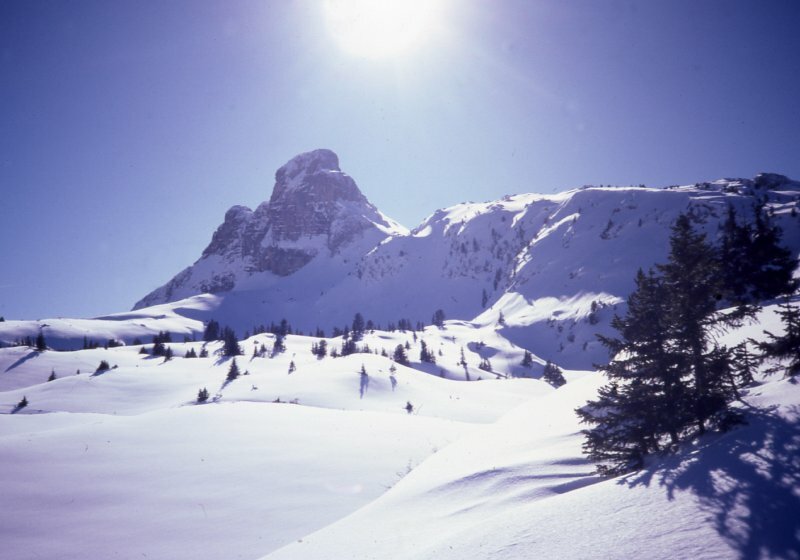 The Col de Famelon just right of centre. 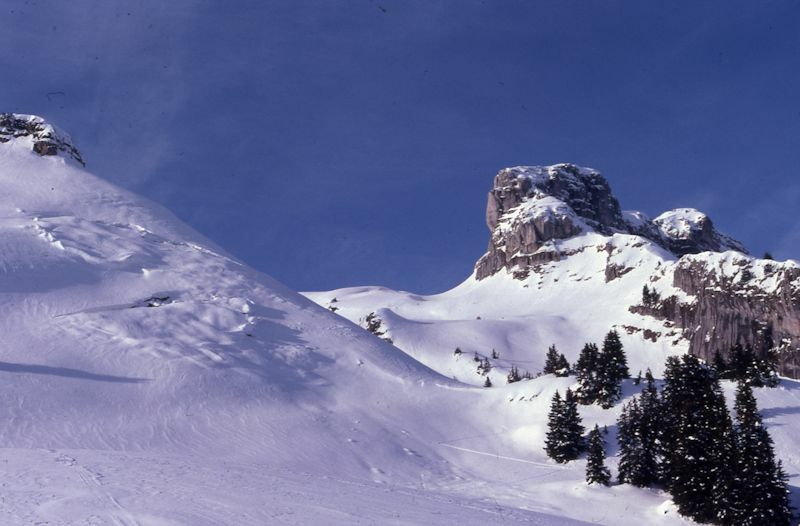 And a fine winter picture of Famelon from the back side, above Pierre du Moëllé, bound for that long route up the ridge, the Rochers de la Latte, on the right. 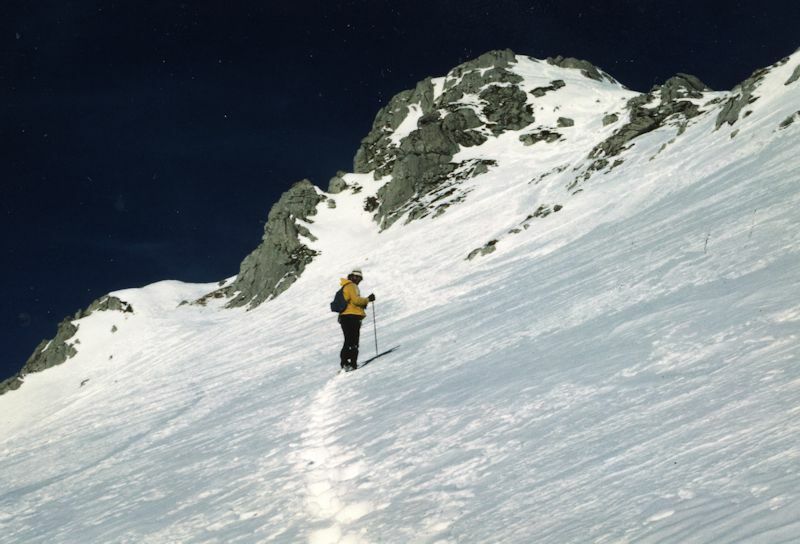 Skier (D. Peck) moving up the Rochers de la Latte towards the back of Famelon, late '80s or early '90s. 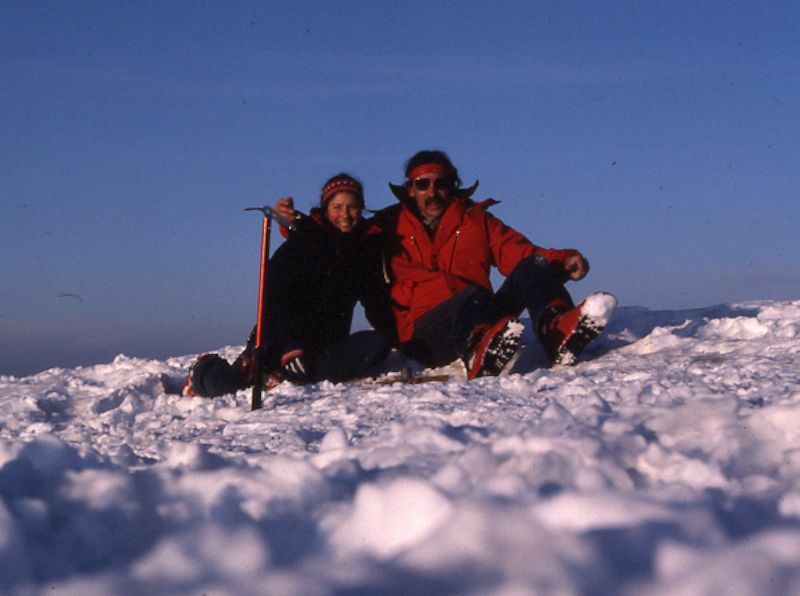 Snowshoer C. Berman toddling to Tour de Famelon on a late afternoon in 1980. 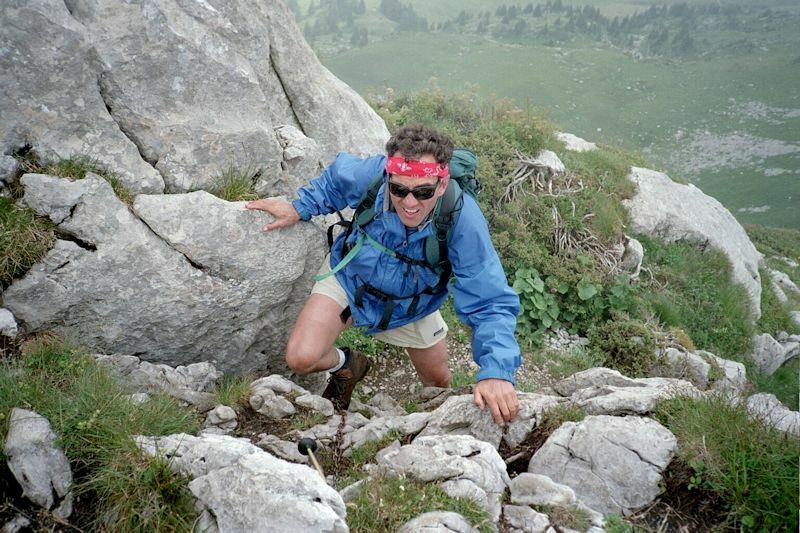 Prof Berman in the saddle between the two Famelon summits, getting closer to his lunch at the top, 1980. 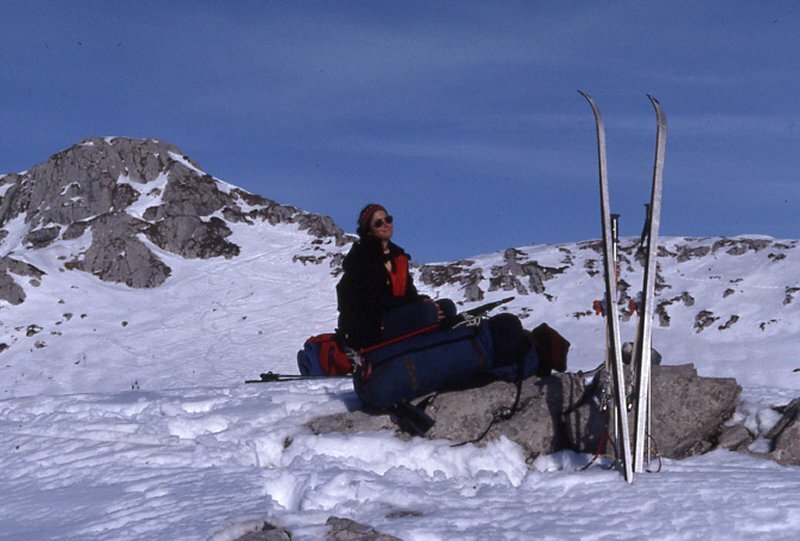 Ms Wilson preparing to set up camp near the end of Truex in 1982, with the Tour de Famelon behind. 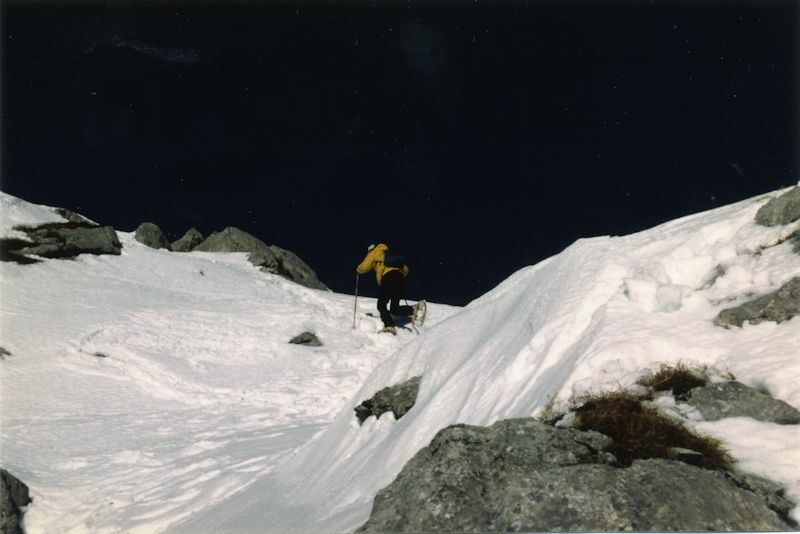 Ms Wilson darting up to the Famelon summit at dusk, 1982, before camping on the pass in a very awkward storm. 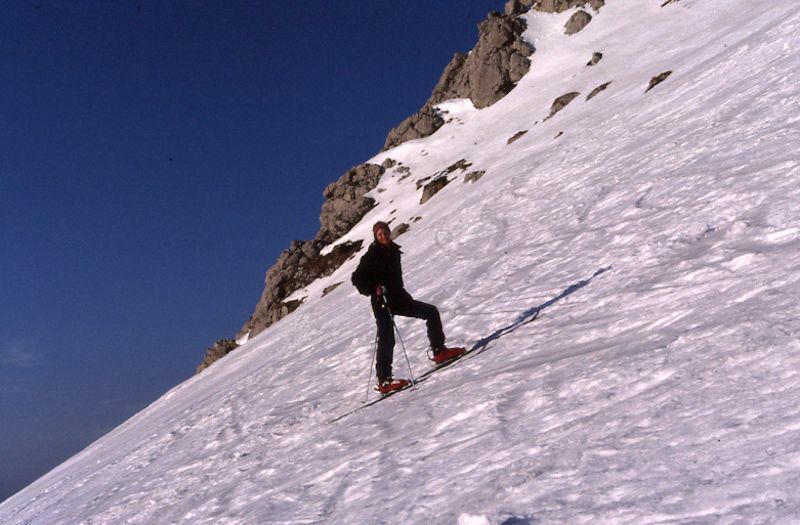 Mr Peck marching up from the Pierre du Moëllé, onto the Rochers de la Latte, up the back side of the Famelon. 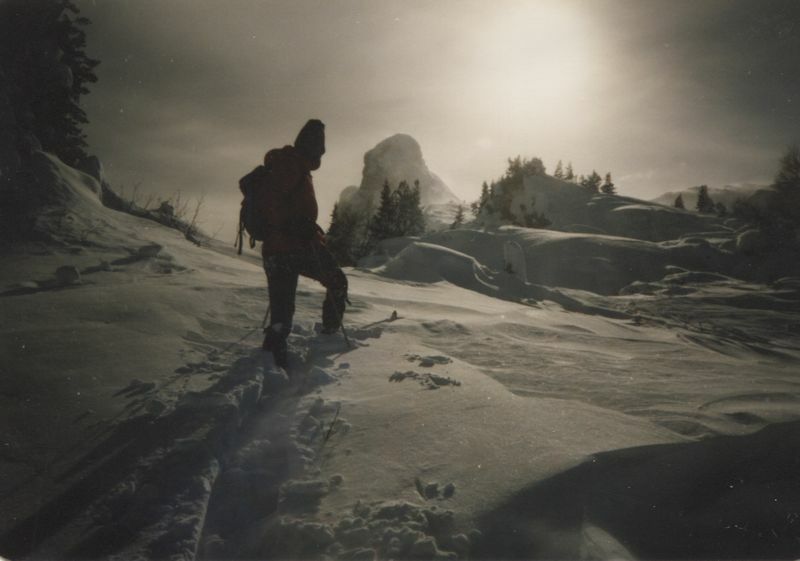 Famelon from the back side, Rochers de la Latte in the center and right, with Mr Peck and Mr Mackenzie deciding how next to proceed, 1995 (Photo: C. Berman). 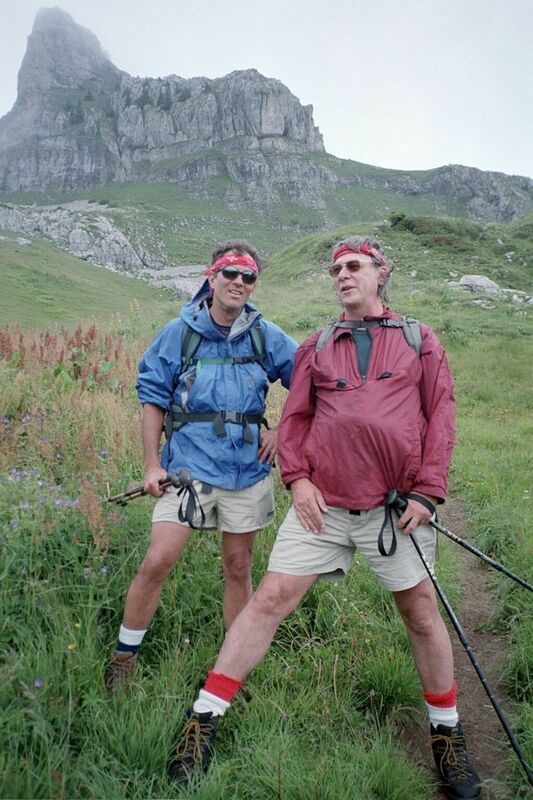 Profs Berman and Peck return to Famelon on a rainy day in July 2002. 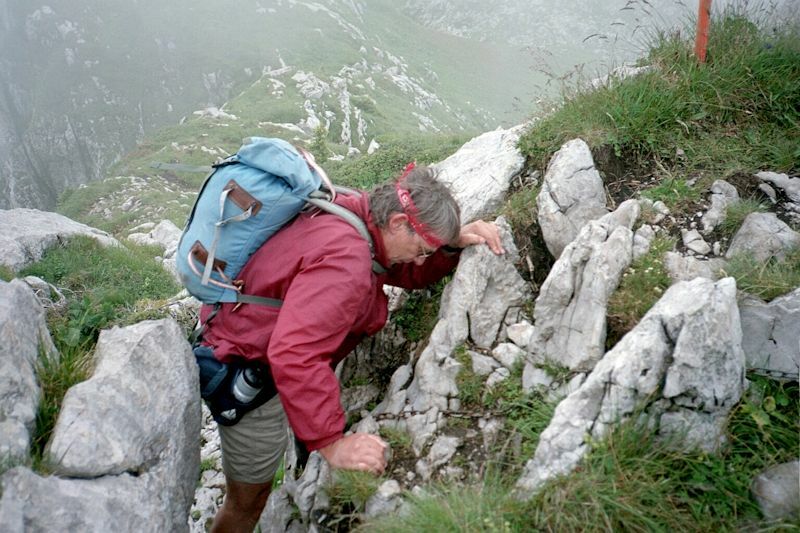 Professor Charles Berman, reliving earlier scrambles onto the Famelon summit some two event-packed decades on, hustles up the chain to lunch at the top, July 2002. Mr Peck, fearing lunch will disappear before he gets his share, hurries along behind, July 2002. 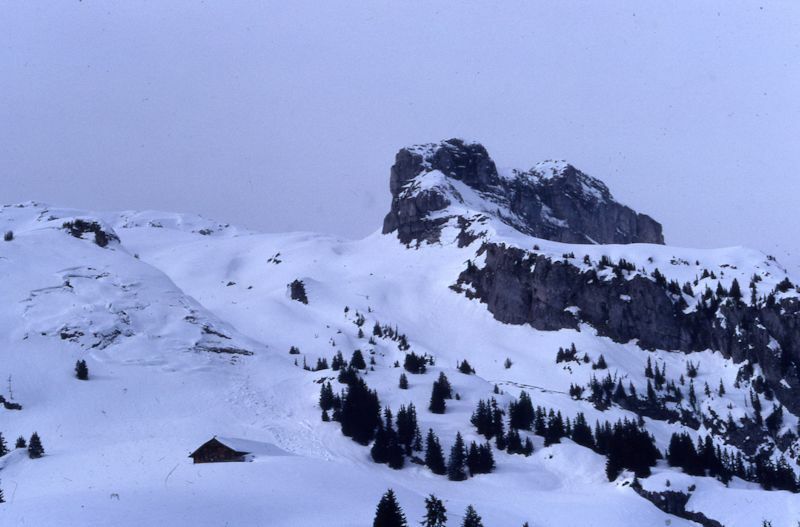 The Chalet des Fers (before the skilifts) from near the top of the Tour de Famelon, ca.1980. 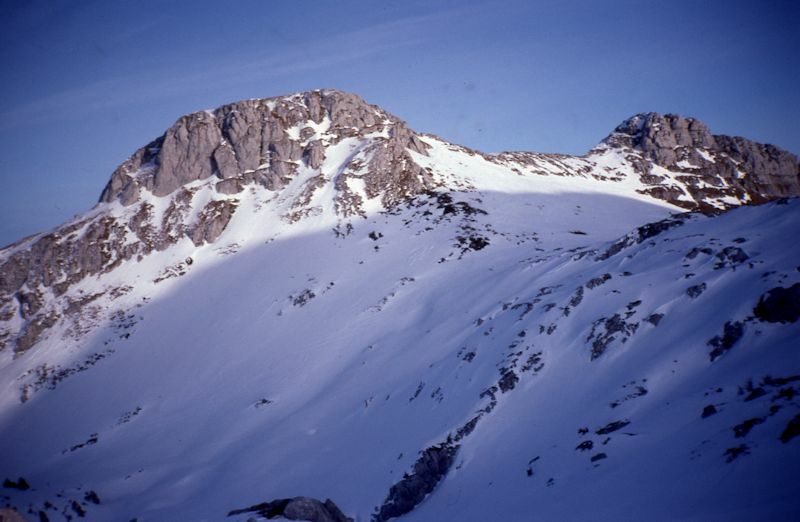 The front part of Famelon, seen from the saddle, about 1980. 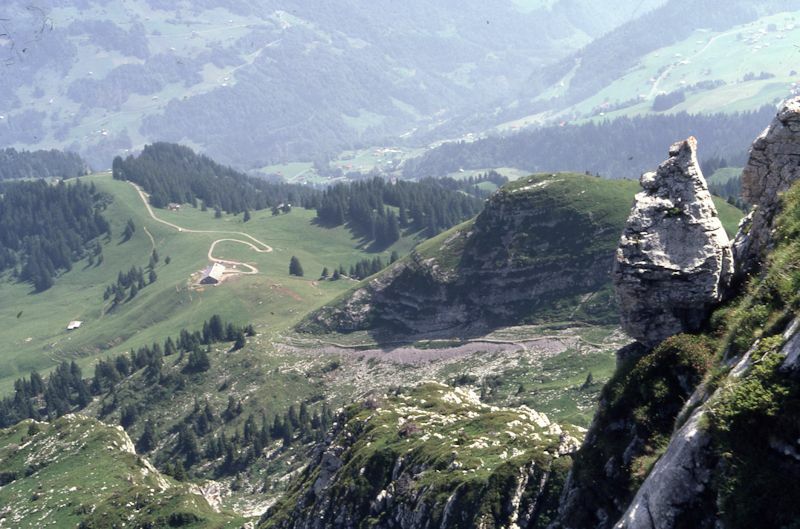 Leysin is just visible down on the right. 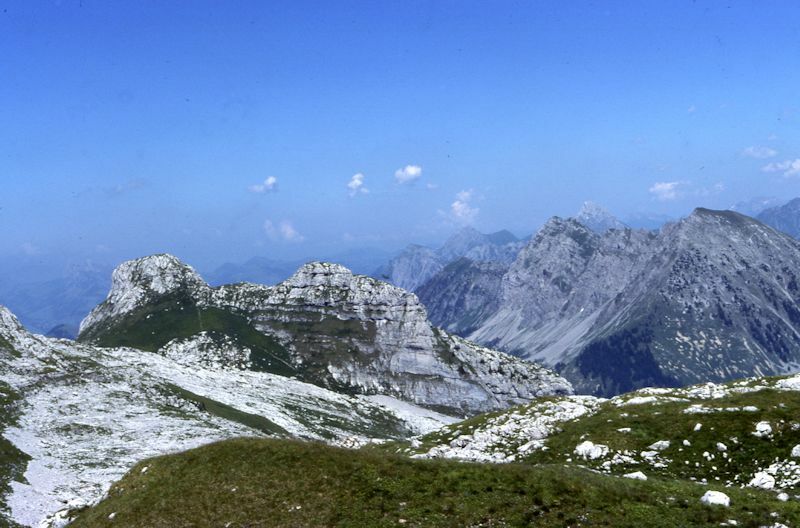 The Tour de Famelon, July 2006, from Ayerne in the valley of Hongrin to the north. 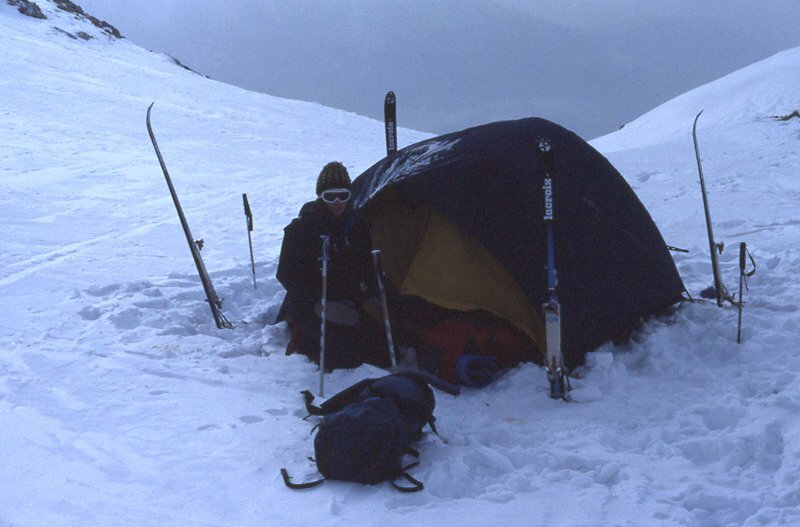 More Famelon winter camping here, 1982. 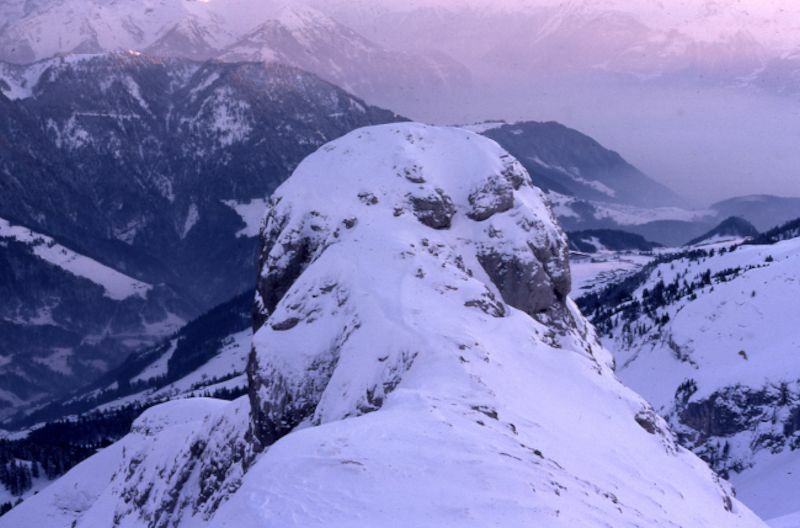 Feedback and suggestions are welcome if positive, resented if negative, . All rights reserved, all wrongs avenged. Posted 11 January 2003, revised 10 April 2008, 14 March 2014.